Take a few moments and let the rest of the members know about yourself, your EVW and your interests. 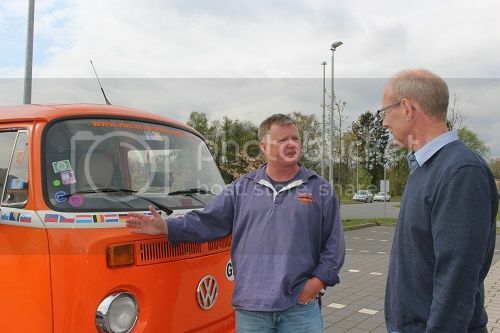 This was me in 2016 explaining to the Station Commander at Oldenburg Feuerwehr about the travels "Clockwork" has done since 2007, kindly note the new respray undertaken in Malta. I managed to thank the fire crew for maintaining the vehicle so well for 24 years and thus allowing me to continue travelling! Nice one Mark, and I like the new Maltese stripe ( surprised it's not been turned into a Maltese red cross bus! ), was it just the white stripe or the whole bus you had painted? Looking forward to the book, can't beat a good travelogue. Read Inshallah a few years back, loved that. You should keep all the comedy bits in and things going wrong, that's just life. Please feel free to plug it on here when you are ready, it's definitely EVW related.